Emil and his wife hiking Camelback Mountain in Scottsdale, AZ. Last month I went to Scottsdale, Arizona, where I attended the U.S. Pain Foundation’s annual INvisible Project gala. Over that weekend, I also hiked Camelback Mountain. The two experiences shared more in common than I could have imagined. Every year, the U.S. Pain Foundation brings light to the hidden lives of people with chronic illness. They focus on two different conditions and publish two separate magazines, telling the stories of real people living with the conditions. 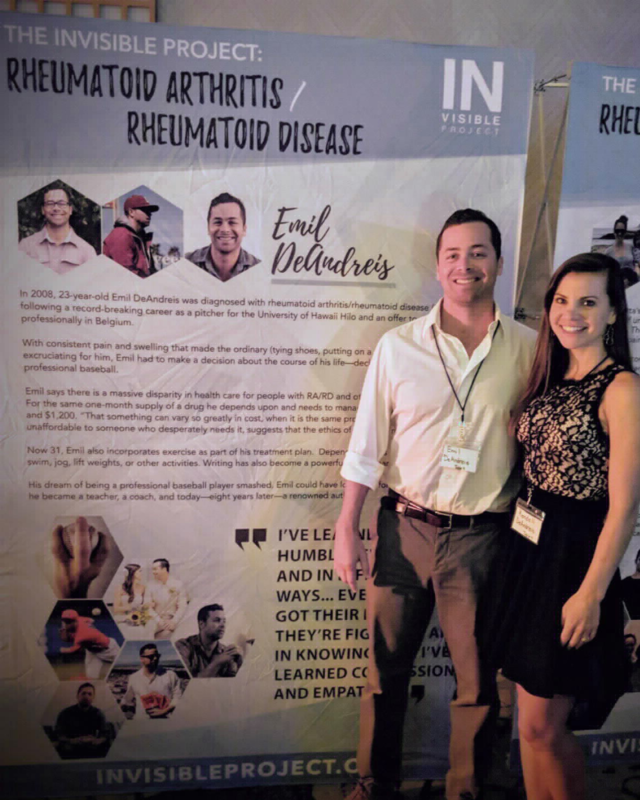 This year, one of INvisible Project’s focuses was rheumatoid arthritis (RA), and because I was fortunate enough to be featured in their magazine, I was invited to their annual gala. Without thinking much about it, I said I would love to attend! My wife is a go-getter, and loves a good challenge. So when she heard we would be spending a weekend in Scottsdale, the first thing she did was look up the most physically demanding activity possible. The activity got points if it involved having to peel ourselves out of bed at some ungodly hour. She found Camelback Mountain, a three-mile hike described as “an intense and difficult anaerobic hike the entire 1.23 miles to the summit. It ascends approximately 1,280 ft.” Oh yeah, and it was best to get there before 6 a.m. because any later and you’d risk the punishing 100-degree heat. Several people died on this trail every year. My wife was deliriously excited. Again, without thinking, I replied, sure! I stood in front of the mirror of our Scottsdale hotel, getting dressed in “cocktail attire,” (which I had to Google). I realized I was having to take deep breaths. I was uncomfortable. The idea that in minutes I’d be taking the elevator downstairs and engaging in conversations about vulnerability and pain suddenly became very daunting. Emil and his wife at the Invisible Project gala. The reality was that sometimes I enjoyed the fact that rheumatoid arthritis was invisible. To me, not always having my disease exposed was a blessing. And at this gala, my mask of normalcy would be lifted, and I would have to be honest with other people. In the room, I quickly discovered that each person featured in the magazine had a life-size printout of themselves with their stories blown up for everyone to see. Hundreds of people were walking around reading my story, the way parents inspected science fair projects in middle school. Afterward, we all sat down, and a video was shown of us answering questions like: “What is the most challenging part of your life?” The music that accompanied this video was miserable. All around the gala, people’s eyes were watery. I began to feel squirmy and wished I hadn’t come. I did not like having my weaknesses and inabilities in the spotlight. I did not want people feeling sorry for me. We began our hike at 6 a.m., when it was already almost 90 degrees. The first step was uphill, and there was never a flat step after. There were parts so steep that there was a railing to hold onto. Some long stretches required you to climb with hands and legs up boulders. I would pause, and look ahead, and I could see people as small as ants way up the mountain, who weren’t even close to the top. My heart was pounding and we were already almost out of water. In the back of my mind I recalled hearing about unprepared hikers dying on this trail. The keynote speaker of the gala was a woman named Karen Duffy. I was immediately all-ears after learning she’d played a small role in the Jim Carrey movie “Dumb and Dumber.” She said something that changed the shape of the evening for me, which was that with RA, we often wear different masks. We wear masks to appear normal, and able-bodied. We wear them at work, at social gatherings, and around our families. And wearing these masks can get heavy, and stressful. She said at this gala, everyone should feel the relief of taking the mask off, being their normal selves without fear of judgment or stares. This was enlightening to me, as I’d always looked at the mask as a crutch. But that night, I looked at it differently, and with everyone else in the room, I took it off. I met the others featured in the magazine. We laughed; we had fun. There was a DJ, and there was dancing and the feeling in the air was of elation, and triumph. By the time we reached the summit, my legs were wobbly. Sweat stains lined my hat. Sunscreen was in my mouth and eyes, yet I somehow managed to get burnt. But, the view was spectacular, and there was a calming silence in the air up there. Filling me was a sense of relief that instead of walking away from the hard part, I had stayed in it, and walked through it. The weekend allowed me to meet new people who I remain connected with from our stories and laughter, and it taught me the value of leaving your comfort zone, and staying there, until you feel comfortable.